I’m sure you’ve seen them. People post a pound sign (#) followed by a bunch of words clumped together, that can sometimes be difficult to read. What you may not know is that those hashtags become links. Click one and you’ll be served a list of posts using that hashtag. This can be great for your business because you can become visible to a potential customer who may not have known your store even existed because they were searching for, for instance, “#NationalPetDay”. In the examples below, I’ll show you how you can generate some hype during slow times by getting creative with hashtags to promote a sale or event in your store. In addition to your standard advertising channels, (text blasts, store signage, website promotion, etc.) you should promote your event on your social media channels. Post details about the event in the weeks leading up to the event. You can even create a Facebook event and invite people. Be sure to post photos of items for sale and decorations leading up to the event. Photograph the festivities and post during and after so those who couldn’t make it this time will see how much fun it was and want to come to your next one. You can also use hashtag holidays to build moral amongst your employees. The way I see it is any excuse to celebrate is a good one! 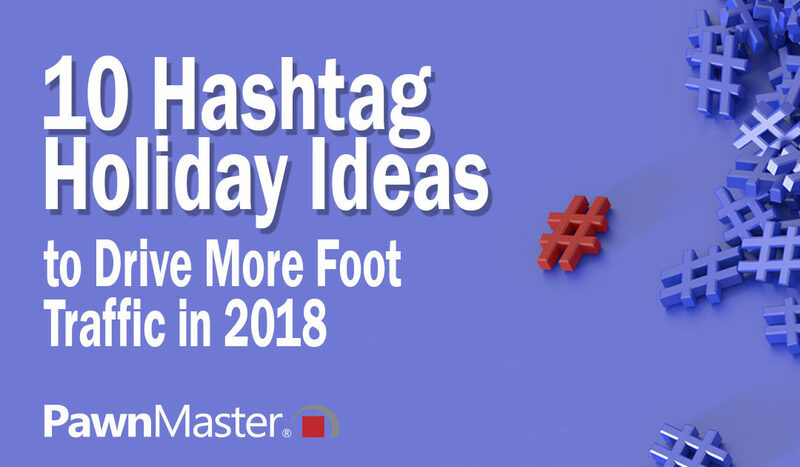 In addition to your standard holiday sales – Labor Day, Memorial Day, Mother’s Day, Father’s Day, Valentine’s Day, Black Friday, and so on… Here are some ideas to have some fun with hashtag holidays. Put a little spin on Valentine’s Day… The day after, let’s celebrate all those single folks. You can hold a “Treat Yourself” sale. Have some fun with this one. Make your single customers feel good about treating themselves with that item they’ve been eyeing in your store. Do a deep discount on all electronics. Allow customers to bring their (friendly) pets into your store. Have dog bones and water bowls ready. Hold a cookout serving burgers and hotdogs to customers. Give people a discount for taking a selfie and checking into your store. Bonus points if they give you a 5-star rating! This one is especially great for jewelry shops. Sweeten your guests up with a nice chocolate covered strawberry and a small glass of champagne. Get them really enjoying themselves and wanting to browse a little longer. Take it one step further and partner with your local florist to give a discount on a dozen roses to anyone who makes a purchase. You know all those items on your shelf that have lost value over time and are really just taking up space? Wouldn’t it be great to get rid of some of it? Stick a bunch of those items into a “Prize Bin” and let each customer pick an item to take for free when they make a purchase. If you have time, you can even wrap them so it’s a surprise. “Show us your colors!” Have customers come in wearing their favorite college team garb and offer a discount when they do. You can even give a bonus discount (like an extra 5% off) if you have a local team and the customer is rooting for them! Today is the day to move video games. Offer a really good discount, maybe “buy one get one free”. You can take it one step farther and offer discounts on video game consoles and equipment too.